> Articles > What price DKBA ceasefire agreement? What price DKBA ceasefire agreement? The ethnic people of Burma crave peace. In the recent years they have voiced their support for a genuine political dialogue that will deliver long lasting peace for their people. Ethnic people working for a wide variety of community groups and canvassed by Karen News said the Burma government has ignored calls by ethnic people for unified peace talks with the United Nationalities Federal Council (UNFC), an alliance of ethnic armed groups. Instead ethnic groups have criticized the government for what they claim is a campaign to negotiate individual ceasefire agreements as hastily arranged quick-fix strategy to appease the international community. Ethnic community workers have expressed their concern to Karen News that some factions of the ethnic armed resistance may be enticed by Burma’s military dominated government to sign ceasefire agreements for short-term gains or their own personal profit that will sabotage a genuine long lasting peace agreement. Saw Win (not his real name) works for a high profile community based organization and says. In recent months the ethnic opposition movements have shown a genuine desire to present a unified front. In August this year the UNFC sent a letter to Burma’s President Thein Sein outlining the alliance’s urgency for peace talk because six decades of fighting a civil war has saddled the country with political instability and has turned resource-rich Burma into an economic basket case. The Karen National Union’s Vice President, Padoh David Thakabaw, an UNFC member, was reported saying. Professor Desmond Ball of the Strategic and Defence Studies Centre at the Australian National University in Canberra said in an interview earlier this year warned that the military regime is expert at finding and manipulating divisions in the ethnic resistance movement. “They find a crack, whether it’s religion, political or just greed and they massage it until there’s a split. It is a tactic that has worked on all the ethnic groups. For every non-ceasefire group there’s at least one ceasefire group. 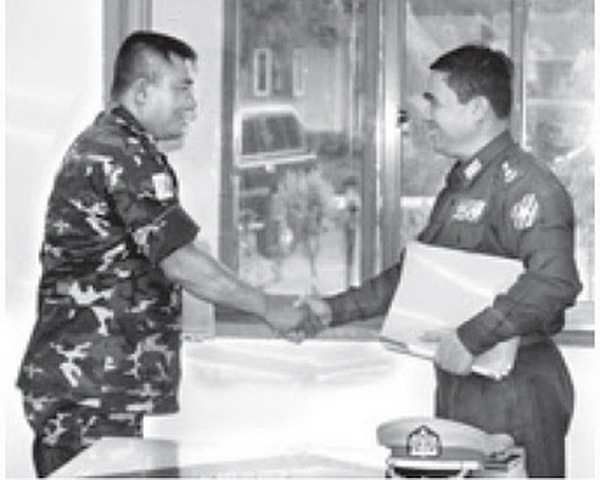 Major General Saw Lah Pwe echoed Professor Ball’s warning and admitted at the time of his sacking of Myawaddy, that in his time as leader of a militia aligned to and sponsored by the regime, he had learnt a hard lesson about the importance of Karen unity.